Influenza is a common disease in humans and animals—mainly poultry, pigs, horses, and wild birds. The economic impact of animal influenza viruses on agriculture can be substantial, especially in the poultry industry, where millions of birds have been eradicated worldwide in disease-control efforts. There is also an ongoing human-health concern. Some animal influenza viruses are evolving into new strains that could potentially infect humans and lead to a pandemic. An example of this is the 2009 H1N1 pandemic virus. When diseases are transmitted from animals to humans, they’re called “zoonotic” diseases. The Agricultural Research Service (ARS) has dedicated significant resources to combating the threat of animal influenza viruses for decades. The ARS Office of National Programs has organized scientific workshops with world experts to identify research priorities that will have the most impact. The report from one of these workshops provides key information that serves as a guide for research institutions worldwide and captures the magnitude of the effort to protect animals and people from the threat of influenza viruses. viruses that infect poultry and other animals. The primary animal influenza A viruses of concern are avian influenza, or “bird flu,” and swine influenza. The main reservoir for animal influenza viruses is migratory wild birds that are mostly unaffected but can transmit the virus to other birds. In poultry, avian influenza viruses cause two types of disease. The mild form (low pathogenic) results in respiratory disease, and the severe form (highly pathogenic) leads to death in many birds. In the last decade, poultry has been the source of zoonotic strains resulting in severe disease and death in people, primarily in Asia. Fortunately, none of these viruses has yet achieved efficient human-to-human transmission. Influenza viruses that infect swine mostly cause seasonal flu-like symptoms, but variant strains have emerged that have infected humans. As a result of potential issues with both avian and swine influenza viruses, federal agencies have identified influenza as a priority disease and a key component of U.S. biodefense strategy. At the U.S. National Poultry Research Center in Athens, Georgia, ARS scientists are at the forefront of research targeting bird diseases like avian influenza. The center serves as a major national and international resource for controlling highly pathogenic avian influenza and other avian diseases. Because of their scientific expertise, ARS scientists there are among the first to be called on by the U.S. Department of Agriculture’s (USDA) Animal and Plant Health Inspection Service (APHIS) when there is an avian influenza outbreak. They study how mild viruses become highly pathogenic, determine how viruses cause disease in poultry and why some strains are more virulent than others, develop rapid diagnostic tests for early detection, improve vaccines specifically designed for disease control and eradication, and evaluate virus genetics to predict the emergence of new strains or help trace the origin of disease outbreaks. In the fight against emerging animal influenza viruses, ARS collaborates with international partners and other federal agencies, including APHIS, the Centers for Disease Control and Prevention, and the National Institutes of Health (NIH). ARS provides APHIS with important technical information that is paramount to trade negotiations of poultry products, such as the risk of low- and high-pathogenic avian influenza viruses being in poultry meat. Importantly, ARS supports APHIS in the case of a disease outbreak. 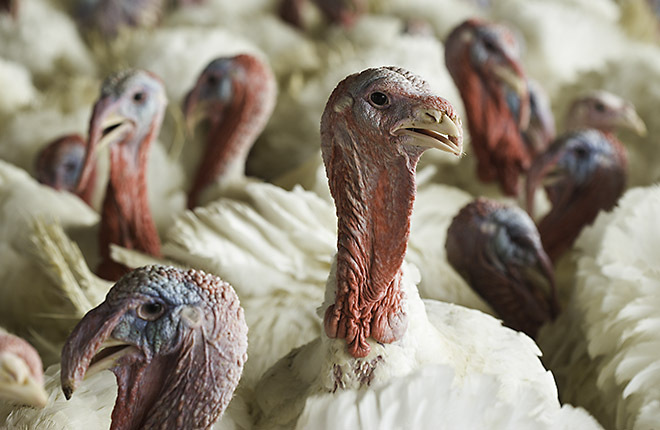 ARS can quickly redirect resources to provide critical scientific information on the characteristics of the virus causing the outbreak, including veterinary medical countermeasures to protect poultry producers. viruses can cross into pigs. The 2009 H1N1 pandemic virus, which was found to have genes from human, swine, and avian influenza viruses, underscored the importance of understanding how influenza viruses evolve. To reveal the frequency, patterns, and drivers of the global spread of swine influenza virus, scientists at the National Animal Disease Center in Ames, Iowa, conduct large genetic analyses of these viruses, integrating demographic data. A valuable asset to this research is the USDA Swine Influenza Surveillance System—an APHIS program that ARS helped develop. The data from this system allows USDA scientists to analyze emerging swine influenza viruses, learn how they are evolving genetically, and see how they are related to past viruses. This information is critical for continuous monitoring of the effectiveness of current diagnostic tests and vaccines. ARS scientists also play a major role in NIH’s Centers of Excellence for Influenza Research and Surveillance Program, which looks at viruses that present a public health risk and conducts research to help combat them. ARS research on animal influenza viruses supports actions to prevent and counter influenza outbreaks and protect animals and people from these especially dangerous viruses. This issue of AgResearch takes an indepth look at the important work under way at these ARS locations. Animal influenza outbreaks can be very costly to agriculture. Some influenza viruses can infect humans as well as animals. ARS dedicates significant resources to combat animal influenza. ARS partners with other agencies to monitor animal influenza viruses.